Basic mechanisms rear PTO:. A two-stage (two-speed) gear independent actuator disposed in the clutch housing, the switch actuators type (synchronous or independent) as well as a planetary gear control selective output shaft which is mounted in the rear axle housing. The speed independent PTO switch gear sleeve which is fitted on the shaft splines by means of the switching mechanism (hex) situated in the body of the main clutch (or rather just the bottom lid). When turning off the PTO lever to be translated into a forward position ", the drum brake sun. gear is released and the brake carrier in turn tightened in this position the carrier suspended and the ring gear driven around on the satellites rotating the sun gear relative to the hub carrier. 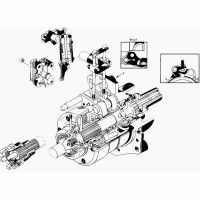 drive agricultural and mechanisms that aggregated front and side views, on tractors MTZ is also a side PTO which is mounted on the left, directly in front of the tractor and of the CAT actuated. After moving gear carried actuator which leash moves along the shaft splines. Side PTO enable and disable necessarily provided off main clutch by means of traction, nah. under the floor (left of the seat).